Profound revelation: What if Apple Watch’s user experience is a peek at the future of iOS for the iPhone? iOS, oh iOS. What are we going to do with you? The iPhone 6 Plus that sits on my desk rarely sees the spark of my SIM card. It’s not that I don’t like the hardware, I love it. It’s not that I don’t like the camera, I love it. It’s not that I don’t like the individual app experiences, they’re great. No, what grinds my gears about the iPhone is Apple’s stubborn insistence to relegate my single layer user experience to a static, non-adjustable grid of icons, and a less than effective partitioned notification and information shade that makes half-use of “widgets,” in a way that only Apple could execute. This is less a whine-fest leveraging the tired arguments that many-an-Android-fan-boy use, like “widgets” or “customization,” ad infinitum. Okay, it is a little bit, but really it isn’t. No, my take on this is squarely on what is basically an 8-year-old user interface. It’s old. 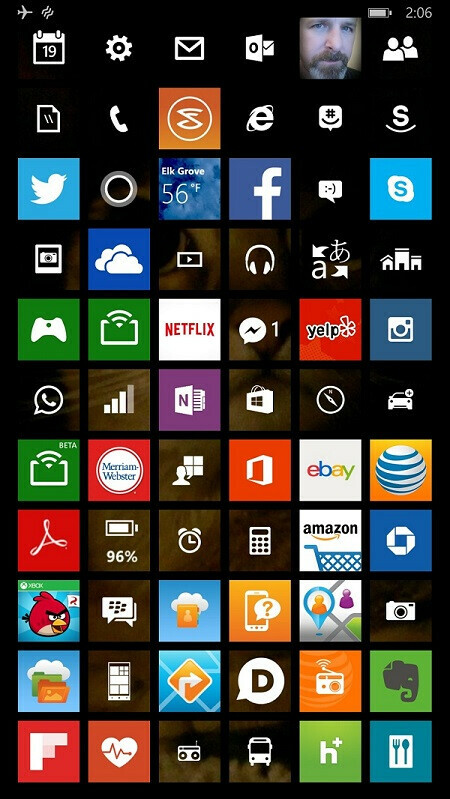 If you like your apps in orderly grids, look no further than the Lumia 1520, it's a grid champion if you want it to be (yes there is a shadowy image of a cat through the tiles, remember, this is the internet). I know some people like that organized grid of icons, and for certain, it is an obsessive compulsive’s dream come true. Though, for the OCD crowd out there that really wants a squared up grid, look no further than a Lumia 1520 with all the Windows Phone tiles set to small, and stacked neatly. It looks like you won Tetris and unlike the iPhone 6 Plus’ paltry 24 icons per screen, the Lumia’s screen will accommodate 66 apps before the need to scroll down occurs. Nirvana. Then I saw the Apple Watch. Now, I already know that it is not for me, as I have opined previously about daily recharging of an accessory that more or less relies on my smartphone anyway. Taken as a whole, it’s just another smartwatch, though make no mistake, it’s going to be a runaway hit. Even my wife, who doesn’t dive into technology the way I do, really wants the Apple Watch to go with her iPhone. Believe me when I tell you that means something because she doesn't even wear any of the watches she already owns, and no, she's not a die-hard-wait-in-the-line-an-Apple-product type person either. Honestly, I think some of the Apple Watch's appeal to her is the same thing that has me intrigued by the device. What has me really interested in the Apple Watch is Apple’s work on the user interface and experience. 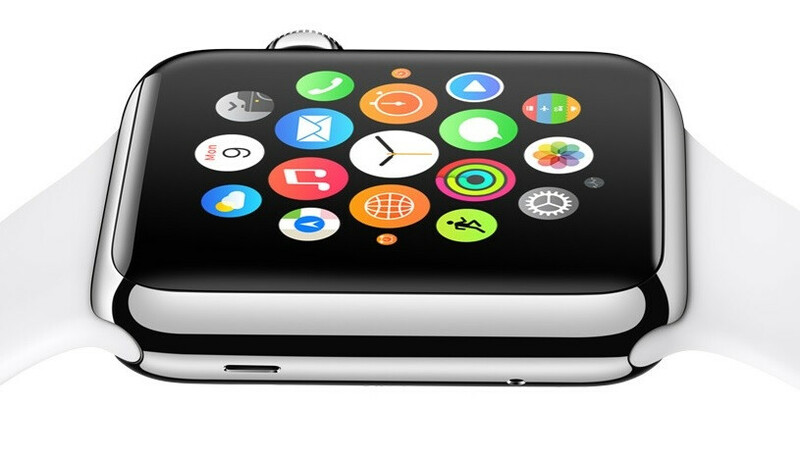 Apple says it is ideal for fast interactions on the wrist. Of course the icons are familiar looking, but the presentation is completely new. Even though it looks like a spinning ball, there is an iOS order to it, a center icon/app with a hexagon structure building out from there. Apple kept the iOS in iOS while taking the iOS out of it a little. I kind of like that. What if? The Apple Watch shows us what Apple is willing to do with its walled garden that is iOS. Jailbreaks have shown us potential, what might Apple unleash next for iOS? The backend architecture is there for iOS, at least it’s a starting point. The priority for animated transitions has always been a distinction for the iOS experience. That is what plagued Android devices for so long until Material Design and ART came along. The point being is that the system software on the Apple Watch gives up nothing on that front. My arguments aside, Apple can afford to take its time with iOS. The nagging feature that was biting at Cupertino’s ankles was the size of the device. Apple rightfully responded with a pair of larger devices and it has sent sales (and profits) into the stratosphere. Now that Apple has joined the “big phone” club however, and assuming the company isn’t going to try and “reinvent” things with an even larger form factor, what else is there to tinker with but iOS? Hey, you never know, Apple could choose to go “bigger than bigger” with its mobile operating system and give people iOS without the iOS. While it would work better on the bigger screen, it's still a hot mess. It looks cluttered, navigation isn't intuitive. No thanks. One touch would alleviate any concerns over intuitiveness, but yeah, it's probably too jumbled for Apple's taste...on a phone anyway. no thanks, i still prefer the "static, non-adjustable grid of icons, 8-year-old user interface". who would stare to the homescreen for a long time anyway? i mean, after i unlock my device, i immediately go to the app i want to use, homescreen is just there for a couple of seconds. the non-app-drawer-homescreen is an advantage for me. Google Now + quick toggles have pretty much killed off any functional need for widgets. Now it's just there for decoration. And now that Google Now will open to developers, widgets are going to be even more useless. Instead of borrowing Apple Watch's home screen, I think all Apple's focus will be centered on expanding iOS UI with Force Touch menus/options. If they make it interesting and consistent throughout the entire OS, that could be their new "Touch ID" or "bigger iPhone" for 2015+. Well that's your opinion, I use Google now but not for everything... I still like widgets for music control, calendar, notes (Google Keep), camera shortcuts, and then some that Google Now is not able to do and will not necessarily come with the opening to developers. Widgets that are practical and do not drain the battery is what I like. No social apps. it's still cluttered and the lack of easy reorganization options... I'd be less critical if a simple option to alphabetize or order by usage were available. I have always thought the watch interface would make it to iPhone. I think it was their plan all along. This is why ios7 and 8 wasn't a complete redo. They wanted to wait for the watch. The watch has been in development for 3 years. I would say that even the physical design of the watch was givin to the iPhone's, not the other way around. As far as the icons, I'm not exactly sure how they would pull that off, but I can see it working better with the bigger screen. Remember that on the phone, the icons will have names below then and there will be folders. Basically, it won't be an exact port, but it will definitely be inspired by the watch. I should have added that the Watch apps run on the phone and not on the watch itself. The UI is sent to the watch. So input and output is gathered and sent to the phone app. Basically it doesn't matter if UI changes on iOS or not. Because the ui is a separate thing on the watch. Also its not like there is mult-window support or anything. For that matter there isn't even real multitasking for developers on iOS. It's easy. The iPod nano was an experiment back in 2010 and it worked. Third party developers were making watch bands and there were even watch faces created for the device. The experiment worked. The square iPod was discontinued a year later. Shortly their after in 2011, watch rumors began to heat up. This was around the time Steve died. In 2012 and 2013, the rumors were in full swing. To beat Apple to market because of fear of another iPhone situation, everybody and their mama started creating smart watches from late 2013 into 2014. Keep in mind that yes, some smartwatches already existed way prior to this like the Moto watch and the Sony smartwatches. Those watches did not sell at all and no one cared about them at that time. It wasn't until the Apple rumors started that everyone cared. Lastly, both Tim Cook and Jonny I've said they started the watch three years ago right after Steve died, so you can take your rant elsewhere. Did you not see the special on ABC yesterday about the gym Apple had set up gathering health info for the last two years? You are absolutely stupid if you think the Apple watch was created in 2014. You can say what ever you want. However they went with POLED display which only came to the market in September 2014. Apples S1 processor only started manufacturing in December 2014. So two of the major components for the Apple Watch only came on the market at the end of 2014. That is the real truth right there. You can dance around pointing at this and that. Talk about the iPod nano 6th gen and pretend it was a success. The thing failed and was dropped because it didn't have the software. Any content you had to plug it into your computer and use iTunes. It was a joke that needed too much maintenance. Apple tried to pitch it as a watch which came later. it doesn't matter what you try to say, sgodsell. Just because it utilizes latest tech doesn't mean it's only been in development for a few months. That's like saying the PS5 will have been in development for a few months, or any other product out there. What they will probably do at first, and maybe android competitors too more or less, will be that intelligent sorting by usage on current UI. Apple will do it unconditionnaly, android competitors as an option you could disable. After that they may be tempted to make the launcher overhaul, especially for IOS10. That will give most of android launchers a run for their money. The saying is, if it ain't broken, don't fix it... Feasibly speaking, the iOS UI could use a redesign in the future, but trying to optimize a UI designed for smart watches on a bigger display isn't the way to proceed. I wouldn't mind seeing round icons in iOS, wouldn't be a bad look. 4-24-15 hurry up, took PTO day for it. What happened to Michael Heller? I haven't seen any new articles from him for quite some time. This is a similar lengthy opinionated article that he would have written. This one?http://www.phonearena.com/news/Is-Microsoft-squandering-its-opportunity-to-roll-out-a-new-flagship_id63577 I hope whatever flagship is in the works really blows us away. It was really good. And for the flagship, I don't really care anymore even though it is vital for the platform. At the moment, I have a M8 for windows and I am not upgrading for another two years. Honestly, I think they won't release a flagship because they want more OEMs to make high end windows phones. They will eventually, but other OEMs are vital. Indeed, except the problem for Microsoft is that it is the de facto manufacturer for the platform, Nokia was 90% of all Windows Phone devices.